Graded MINT 9 by PSA. A recently graded specimen that went from an ungraded raw card to a stunning MINT 9 example that truly borders on GEM MINT 10 status! The sheer joy of unearthing a card like this and having it grade MINT 9 by PSA gives each and every collector the thought that not everything has been found and that virgin collections do exist and are out there to be discovered! Ask a hundred baby boomers whose mothers long ago tossed their Topps baseball cards to the curb which ones they best remember from 1956, and all one hundred would unanimously recall fond memories of card #135. You know, the one of the New York Yankees' superstar centerfielder skying into the bleachers to rob a homerun; you know, the sideways one of "The Mick" with his Texas-sized grin, smiling from ear to ear. In 1956, every kid in the cardboard kingdom had to have this card; and, indeed, it remains one of the most cherished cards of the entire decade, for several reasons. 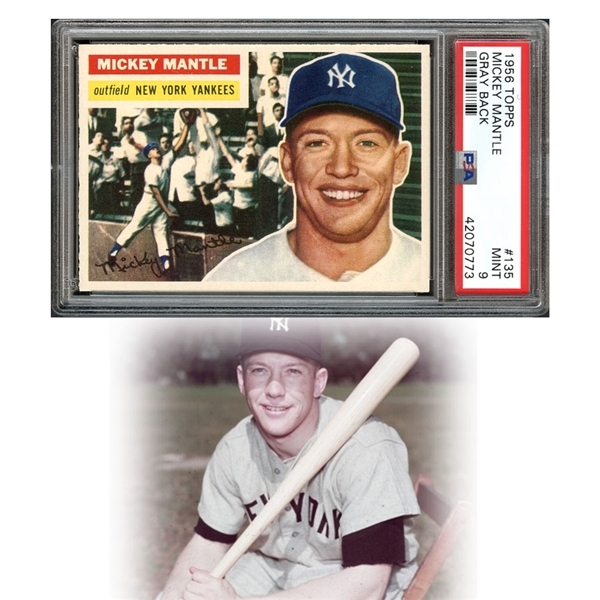 First, even 62 years ago, there simply weren't enough '52 and '53 Topps Mickey Mantle baseball cards to go around. Hardly more than a few thousand 1952 examples had made it into packs and would survive the Atlantic Ocean, and the single-printing of the 1953 Mantle issue created a similar although not as severe paucity of circulating examples. Mantle then made no appearances in the Topps Company's celebrated sets of 1955 and 1956, as the Yankees' charismatic switch-hitting superstar would sign exclusive cardboard rights with the Bowman Gum Company of Philadelphia, Topps' only competition. Of course, when Topps eventually bought Bowman in '56, thereby establishing a monopoly that would dominate the market for next three decades, they also bought back the rights to their original golden boy, the player with whose name the company would forever be associated. So not only is the 1956 Topps Mantle a "come-back" card in this sense, but its novel design also made it the first issue to ever feature two pictures on one card, making room for both an in-action shot of the famous five-tool talent as well as for a smiling and unforgettable portrait, an image lovingly seared into the hearts and minds of countless baby boomers. But that's not all. In 1956, Mantle recorded one of the most impressive productive seasons of all time. His .353 average, 130 RBI, and 52 long balls each led the majors, giving him not only the first AL Triple Crown Award since Ted Williams won it in '47, but the last Major League Triple Crown Award, ever, plus the AL MVP, plus the Hickock Belt, awarded to the top professional athlete of the year. Fifty-three short years later, Mile High Card Company is pleased to offer a perfect PSA 9 MINT example of the most coveted card of 1956. 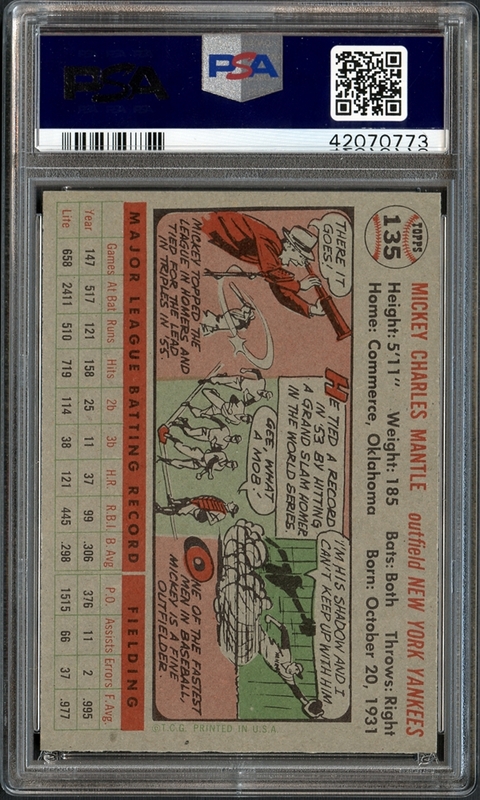 With less than 1% of all submissions to PSA grading MINT, the offered Mantle masterpiece would not only suffice for a collection centerpiece but would certainly make for a unique long-term investment as well. 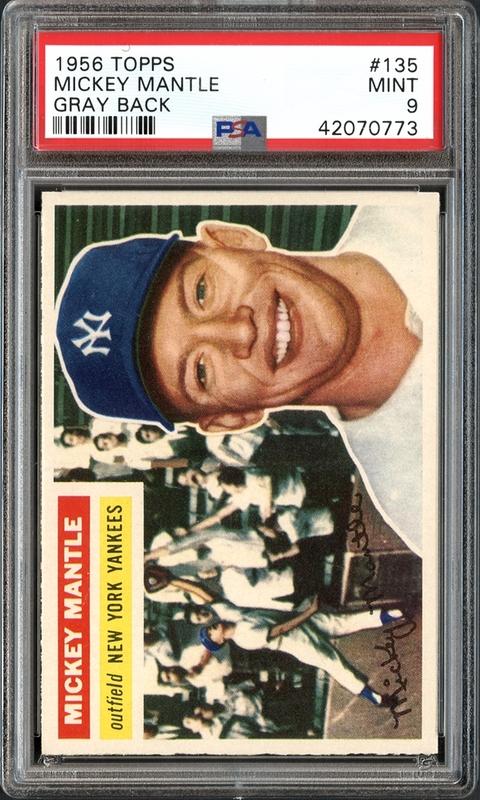 In short, it's one of Mantle's most famous cards; it's MINT--it's clean, it's bold, and it's razor sharp, a definite contender for GEM MINT status!